Hunger is a consequence of poverty, as lack of income is the main cause for people not having access to sufficient food to enable them to enjoy an adequate diet. But there is more to it. Hunger itself causes undernourished people to be trapped in poverty. 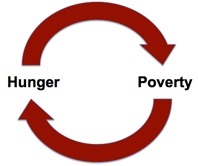 So there is a vicious circle linking hunger and poverty. Indeed, poverty is also a consequence of chronic undernourishment. Numerous studies have shown that undernourishment contributes to keeping people in poverty. A hungry person has a reduced physical and intellectual development, and his(her) working capacity is reduced. He or she is also more likely to become ill and therefore not to be able to work at all. Undernourishment is also a vector of inheritance of poverty. Women who are weak because of insufficient food during pregnancy, give birth to smaller and more fragile children who are more likely to suffer from a physical handicap at birth. Similarly, an undernourished child has a reduced performance at school, first because of a reduced concentration for studying – because of hunger – but also because of an inadequate intellectual development. Finally, poverty is often the enemy of risk taking: a poor person will hesitate to get involved in risky economic activities even if they could be more profitable.